I understand the purpose of A/B testing but is removing the XP bar really worth an A/B test? It's clearly more motivating as everyone on the site has expressed and it's totally compatible with the coach anyway. Why not use A/B testing to focus on New Features like using Lignots to purchase language games/tournaments or something. Perhaps it may be possible for one to inquire, "Does this interject within the policies of this website? Is this appropriate by the standards given by this website?" Regardless, I am incredibly thankful. Honestly. Please inform me if there are any of the said, "interjections." I am a man of integrity and I am a man of morals and ethics. Please inform me and, if I may, once more, THANK YOU! Please enjoy the remainder of your day. No, this does not interfere with the policies of Duolingo. This is a custom script inside your browser, so it's basically a plug-in, not really a hack. Thank you very much for your support, "DominatorX!" I am grateful for this. Perhaps it may be possible for one to say, "If I am correct, I gave, 'th23x' roughly 15 lingots and additional lingots for those whom gave this individual lingots." Perhaps one may add, "I am honestly very grateful for your reply. I am thankful to access a certain, 'XP bar,' currently as well!" Please enjoy the remainder of your day and, if I may, please take care. I can't get it to work. I added the script to GreaseMonkey, it is enabled and 'https://www.duolingo.com/*' is listed below "Included Pages". I tried putting alert("hello") at the top of your script to see if its content is executed at all and it seems like it isn't. I've got the exact same problem. I installed the script with greasemonkey in firefox, enabled the script, enabled greasemonkey, but still no XP bar :( Does anyone have a tip to get it to work? I found the problem! I was doing it all wrong! Or at least, it didn't work the way I tried first: which was: opening 'managing scripts', then adding a new script (at this point a kind of notepad application opens), then 'open file' en open the file, save it again and then close the window. But if I opened te script again for editing, the script was gone again! Well anyway the simple solution was: dragging the downloaded file into the browser bar! Then a installation window opens, click install and it works! Thanks so much! I use several computers and set up userscipts on all of them. All the others I use have install links but I've always struggled with this one. Hopefully next time I'll remember to drag and drop! If you didn't figure this out I had to disable adblock to get it to work for me. EDIT: You may have had a different problem now that I re-read. It won't work for me! It keeps saying "no script is running" even though it's enabled. Of course I looked on how others have inserted scripts into Doulingo...but the analysis on where to find the data and programming the script, sure - that's my hobby :-) Enjoy! Excuse me, maybe you can help me! Since few weeks ago I can not see www.duolingo,com from my google-chrome, so I had to use Firefox. I tried chrome in Linux Ubuntu 10.04 LTS, Windows XP, Windows Vista and Windows 7. ...and 10 more lingots for bringing back my XP bar. Very nicely done, thank you. Thank you so much, this is brilliant! Fíjate en el comentario que dejé arriba, ahí esta cada paso, yo lo hice con Chrome y la extensión de tampermonkey y ahora disfruto de la barra otra vez. I can't download nothing from that link, please help!! Thanks!! It works perfectly fine! I gave you a few more lingots :-). I'm curious. How do you do it? I mean, how does your code get each language's XP? Can you do this in Iron? Thank you so much for suggesting this!! I tried it in Chrome and it worked!! Thank you! Going to try it asap. Muchas gracias! I was able to use your script in Tampermonkey for Google Chrome. Go to the tool bar of google chrome and click on extension. Once you are there click on the tab of Utilities that is in the right and click import the file that you already download from the link. Go to the tab installed scripts and click on th23 Duolingo and select enable. Refresh Duolingo and you will finally have the XP BAR again. that worked perfectly fine.. THX alot both of you !! Brilliant, So happy to have this feature back. Thanks for your clear instructions. works perfectly. It said "unable to parse this! :("
It said that for me when I imported the file that had been within the zip file--when I imported the .zip where it says to import zip files, there was no problem. Brilliant description, thanks a lot, really missed the progress bar. Awesome! Thanks for the excellent instructions. I don't know anything about programming, but I was able to do this following your advice! That's awesome!! Thanks so much! Obrigado! Excellent, perfect explanations ! I do not know how it works but It works very well ! how can i import the file? OMG. dude, you're a genious!!! THANKS A LOT!!! Yay!! I'm so glad to have it back! Thanks a lot! Here are some lingots for your efforts. You are amazing! THANK YOU!!!!! Thank you for taking the time to do this. Your work is appreciated. Let's see if we can get 10,000 people banging on the door to bring the progress bar back. No puedo descargar el archivo de tu pagina :/ Lo podrias subir a otro servidor? Trate ahora y es posible de descagar...puedes tratar otra vez? How the hell do you install this?! I tried and got as far as down loading it, and then nothing. It doesn't install automatically like other user scripts, I found no set up guide to help me, it just sat there doing nothing. Any idea what went wrong? By the way, I have greasemonky. Now script has not work. (Firefox 48.0.2) It is because new version Duo? I answer myself: yes, this is because the new version Duo. Please fix for the recent Duo version update! I'm really happy to get the progress bar back. Thank you! You are the best! Thank you very much!!! thank you so much for this, I cannot abide that Pesky Coach and the way it robbed me of my XP bar, without any warning, or any way to remove him, but I am now Over the Moon to have my XP bar back and a word count etc, Thank you, giving you 2 Lingots for your help! For Opera users : Violentmonkey will apply this script! Ok, your server cannot work in ALL countries, so I got help from my friends of another countries, and now, my XP Bar is back. It works in Opera too, using the ViolentMonkey extension. Why don't you add the script on Greasy Fork? That way, people can find it through their *Monkey extension in FF, Chrome or Opera and install it automatically. Thank you very much. You are both brilliant and kind .I may have to use tampermonkey through google chrome. It may be beyond me but I miss the bar so much I will have to give it a try. Great to have all you tech savvy people here to help the ones like me who are tech challenged. I think greasemonkey is different now and i cant seem to find the "test" can you please explain how to use it in its latest version? muchas gracias! Got it to work, thank you soooooo much. I would have bought that back from the lingot store if it was an option so have 20. Call me stupid - and it's probably because English is not my 1st language either -, but I just don't get it. I'm a complete noob when it comes to things like this. So I installed the add-on, I made this script and wrote "test" in every textbox and saved. I also downloaded that code as ZIP (but it won't open :/) and I just don't get how to fix this at all. 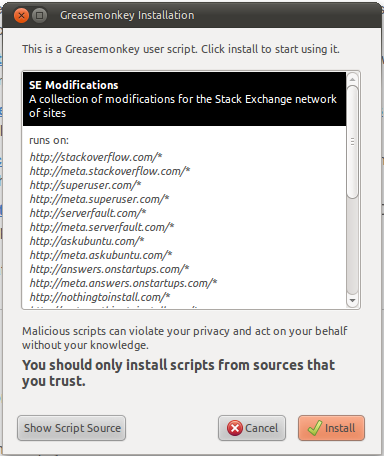 The basic steps are to (1) install the add on, which is greasemonkey for firefox, and (2) install the userscript. You don't have to write or download a new code, as the scripts are already prepared. Go to the wiki to find the userscripts. Click in the left column of the wiki for each one that you want, click the "install" button, or if you don't find an install button, click "raw" (same thing). Wait a few seconds, click "okay", and it's done! Now the userscript will automatically work when you're using Duolingo. You installed the addon, greasemonkey or equivalent. Now you just need to install the userscripts. When you're doing this right, a screen pops up like below, you click "install" and it's done. Hmm, then I guess something about the add-on went wrong, but I installed it anyway and I see the icon of the monkeyhead right above. The monkey head shows the first part is fine. Then pick the userscript for the progress bar from the wiki. Hmm I see what you mean, it opens a zip file, which happened to me before too and I'm not sure what I did. The script doesn't open the box. Hopefully someone who knows the process with a zip file can comment. Bring back the level bar ! Apology to Duolingo for XP Complaining. When you get your first xp for the day at 11:57 p.m.